Whether you're interested in tracking your expenses or you're planning to save up for something down the road, there are plenty of apps that can help you easily set a budget, log your expenses, and even do some micro-investing on the go. If you are in need of the best personal finance app for you and your spouse and your family budget, we searched and have the most efficient app for that purpose. Let’s see what the app is about. What is FinancyBirds all about? The FinancyBirds is developed for IOS users, just for couple and partners that need help in maintaining a transparent financial record. With this easy to use and simple personal finance tool, the users will get their chance to use helpful and efficient features that will give them a completely new perspective of how they spend money, giving them the opportunity to manage their money and investments better. On the app, couples and spouses can track expenses and incomes from various modes that they manually determine. This finance app for its users is offering multiple features that are specially created for couples that need help in managing their family budget. The user with the help of this app is able to easily and without much effort track his expenses and incomes coming from various modes, controlling the recurrence of these activities so he can get automatic updates in the certain time period. 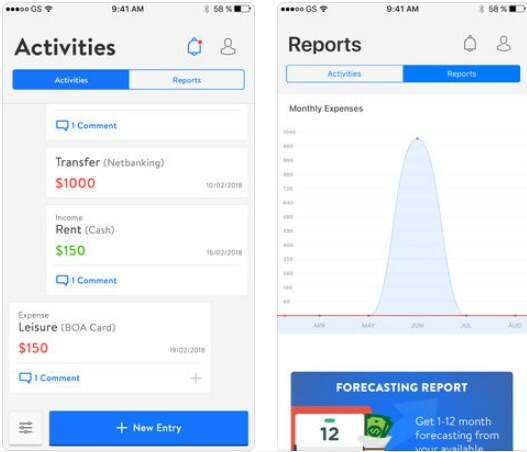 On the app, the users are allowed to set their budgets, comment on the activities, and effortlessly manage daily finances. The spouses or couples on the app are able to track and plan their financial status from current and forecasting reports generated from spending habits and monthly earnings they have. The app even allows the user to add a partner to the FinancyBirds and also get chatting facility regarding entries if he needs. Sending the users notifications, the app shows them a detailed report on expenses and incomes, giving a comparison of expenses between categories/ time line / among couples or partners. Couples are able to set a budget for each category as well as full budget, adding recurring expenses or income, manage the modes, get reports by email and see forecast reports. Download it on App Store now for free to track your expenses and incomes effortlessly!